What is a Lasagna Sky? A lasagna sky is one that is layered, like lasagna. The layers are white, but in the sky the filling between them is blue. Here's an example. I took the photo above just south of San Luis Obispo about 11 AM as we were continuing our trip from Paso Robles to Newbury Park on October 29. It had recently rained and the clouds were still in the sky. 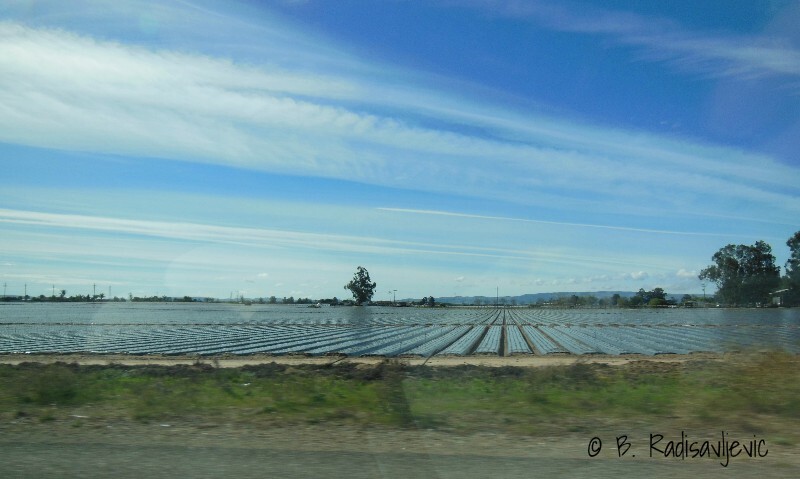 Not all of them looked like these, but the layered appearance was around until we left Santa Maria and got closer to Buellton. All these photos were taken from a moving car. You can see the covered growing fields as we pass by. 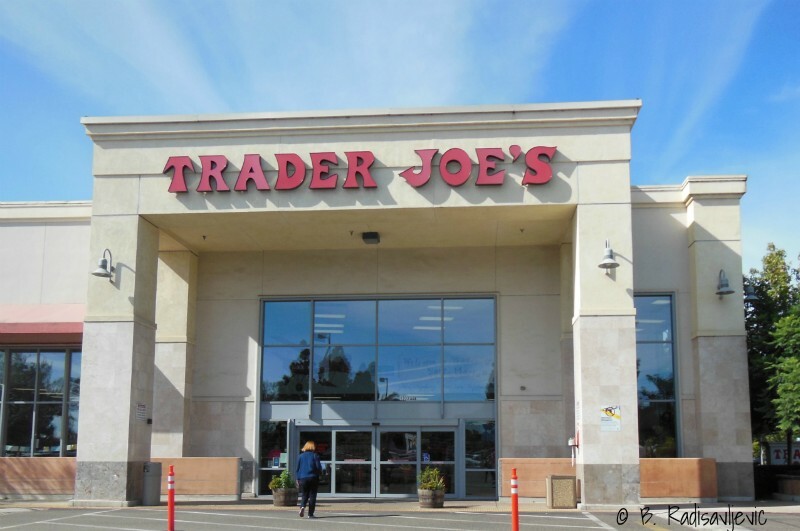 Once we get to Santa Maria, we usually make a rest stop at Trader Joe's off Stowell Road, by Costco, on Bradley Road. They usually offer a sample to snack on and a bit of coffee. They also have clean restrooms. We normally buy something we need there, as well, and it makes a nice break from the road. Yesterday we bought bananas for the rest of the trip. We stopped again on our return trip to buy the other items we needed to take home. They needed to go right into the freezer. Do you see lasagna skies where you live? I had no idea what to expect. I knew they were encouraging members to renew their memberships and giving those who renewed free tee-shirts. I had already renewed and got my shirt. I was happily surprised to see a friend I'd lost touch with and have a chance to catch up with her a bit. But I didn't see much evidence a party was about to happen. I had come early to get a parking place with the intent to do my workout before the celebration started, so that's what I did. I expected that when I finished, the party would be in full swing. When I finished my cycling on the stationary bike, I came downstairs expecting to see evidence of the festivities in the lounge. I saw nothing unusual except a couple of people sitting in the chairs with plates of food. I finally asked where the food was being served and was pointed to the hallway that led to a gym I didn't even know was there. The door was open. There was little light inside, and most of the chairs around the tables were already occupied. The food was hiding at tables near the farthest wall from the entrance. 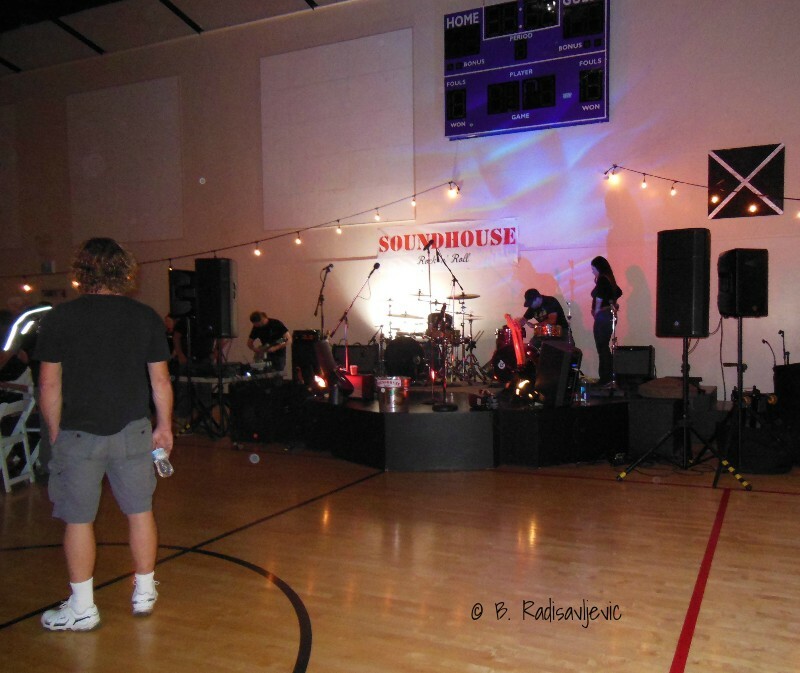 Most of the light in the room came from the strings of lights you see and the spotlight where the band was supposed to play. When I was there it hadn't begun to play yet, and we were treated to loud recorded music instead. The food was mostly ethnic and quite tasty. It was served by local caterers that did themselves proud. This was one of the few times I could not clearly see what was being put on my plate. There just wasn't enough light. I did not leave hungry, and I'd tried some new foods. The hard part was finding somewhere to eat it. I finally found a place on the bleachers. 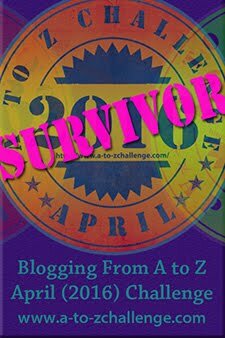 As I sat near the wall eating my dinner, there was a sudden explosion a few yards in front me. Some people had been moving the strings of lights and one fell. At least one light exploded, but there may have been more. It was too dark to see exactly what happened. I felt sorry for the crew with brooms that were trying to sweep up the pieces in the dim light. By the time they cleaned up as best they could, I had finished eating and it was time for me to leave. 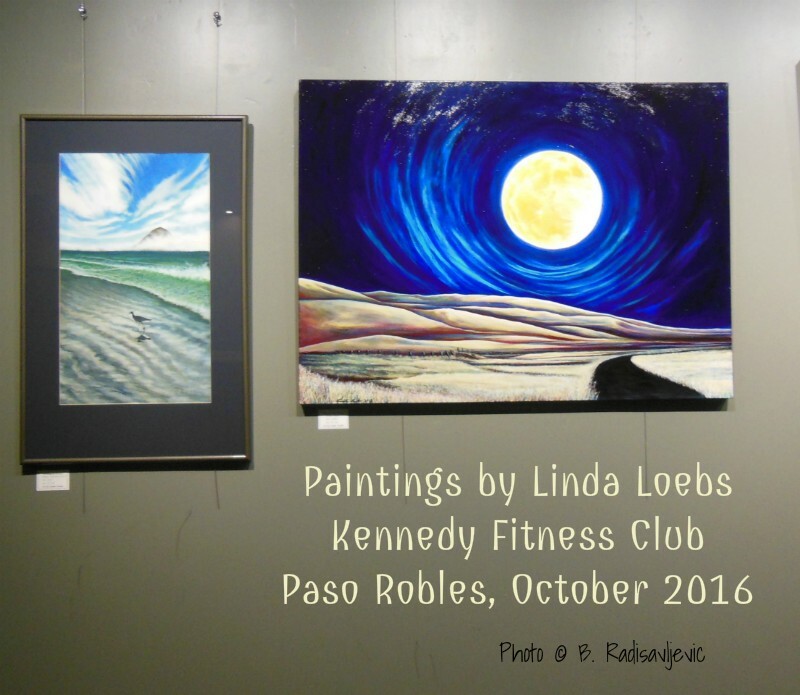 It had been a Kennedy Club Fitness Paso Robles Adventure. Happy Anniversary, Kennedy Club! 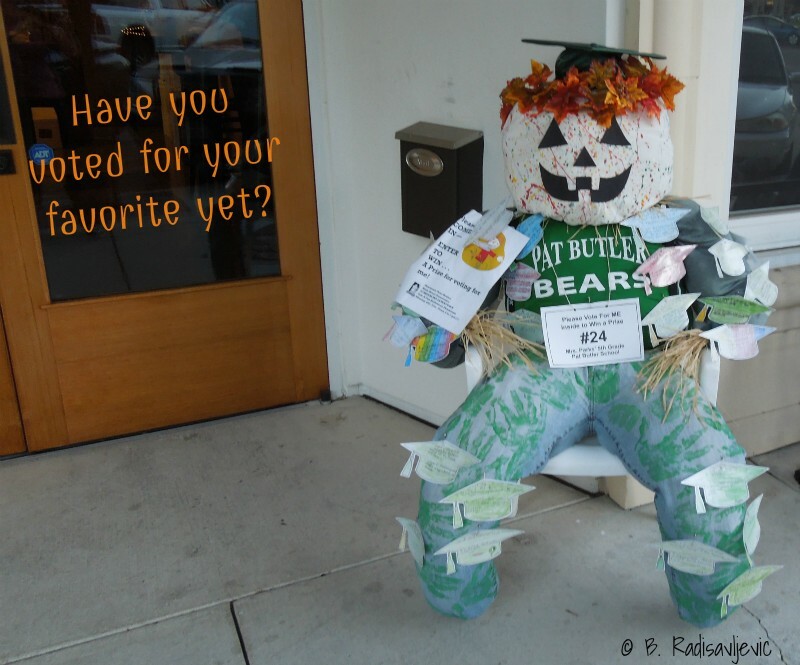 Have You Voted for Your Favorite Scarecrow Yet? 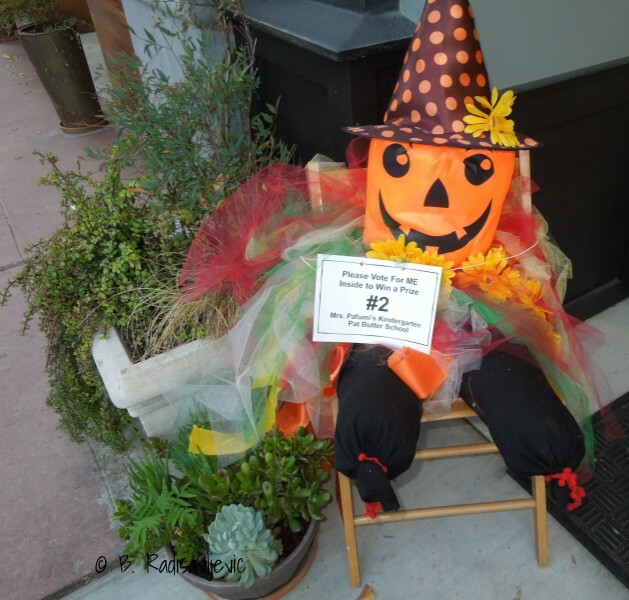 The deadline to vote for your favorite downtown scarecrow is October 28. Walk around downtown, look at all of them, and when you find the one you like best, go inside the sponsoring business and vote. You just might win a prize. 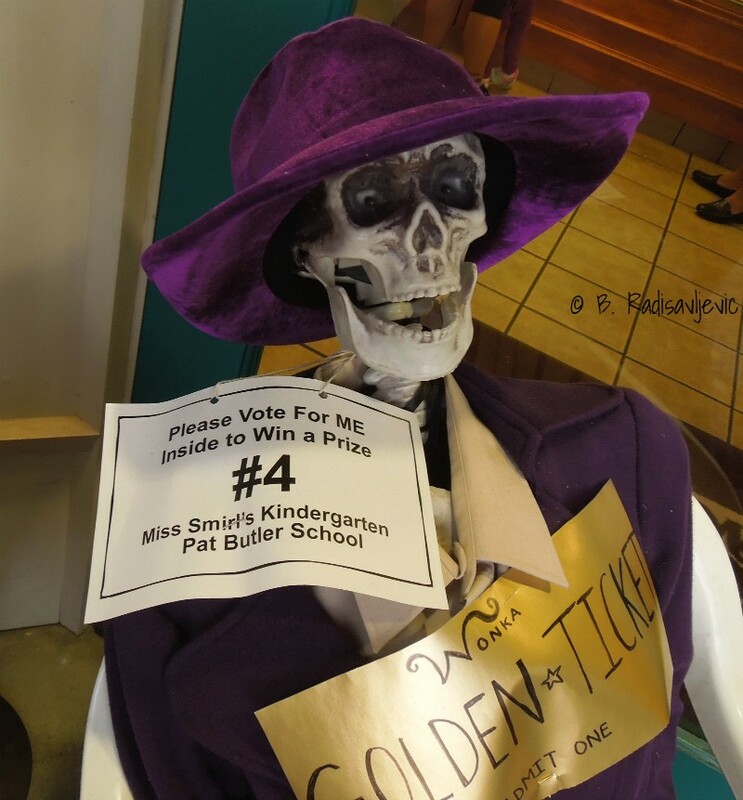 Prize-winning voters and the winning scarecrow entry will be announced at the big Safe and Fun Halloween Party in the park on October 31. Get more details on both contest and party here. 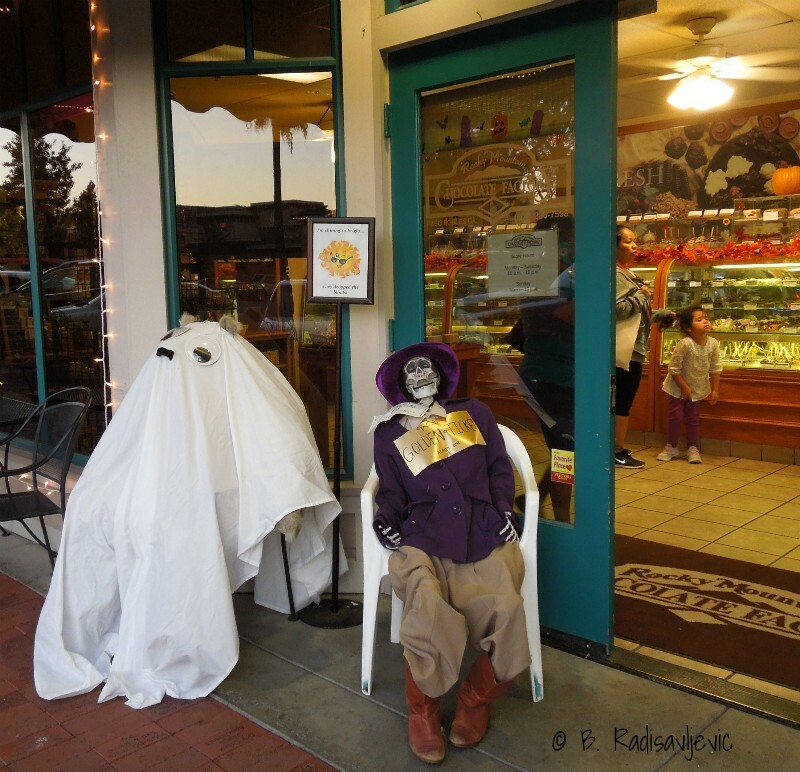 Do you know who is under the ghost costume in this photo? If you do, please put your answer in the comments. For a hint, consider the location. If you frequent the businesses by the park you will know the identity. I got downtown to look around after most stores had closed and I didn't have a map. Here's what I found as I walked around near the park. This is a closer look at the fellow next to the ghost. I wanted you to see his sign. I tend to like book-themed characters and costumes, so I was immediately drawn to this scarecrow version of the Cat in the Hat. His costume is similar to the one below. Here's one with a pumpkin head. 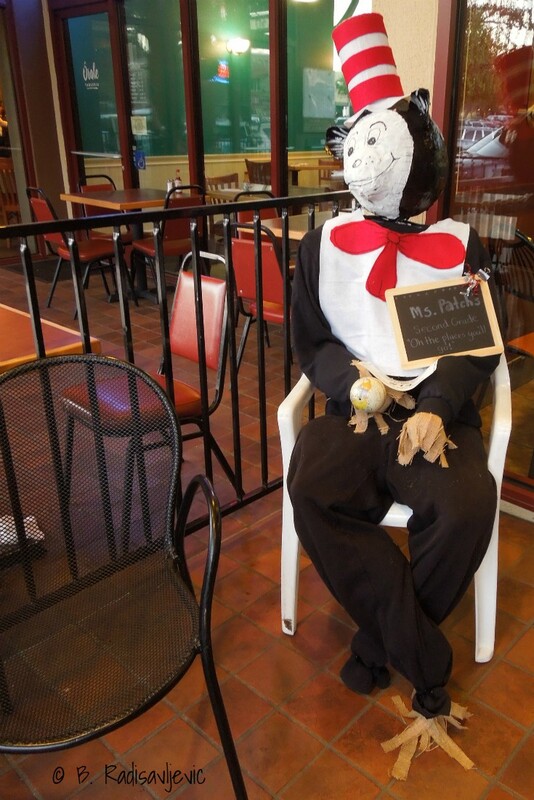 Here's my last scarecrow photo. I wish I'd picked up a guide, but I hadn't thought to do that. 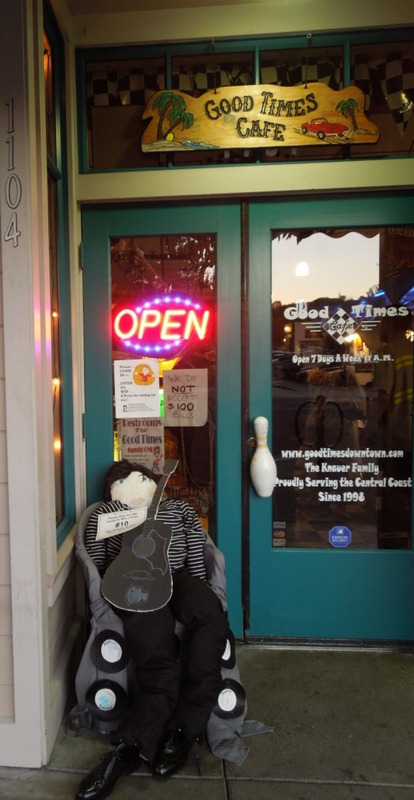 I did see one scarecrow hidden after the business sponsoring it had closed, but not enough of it was visible to photograph it. 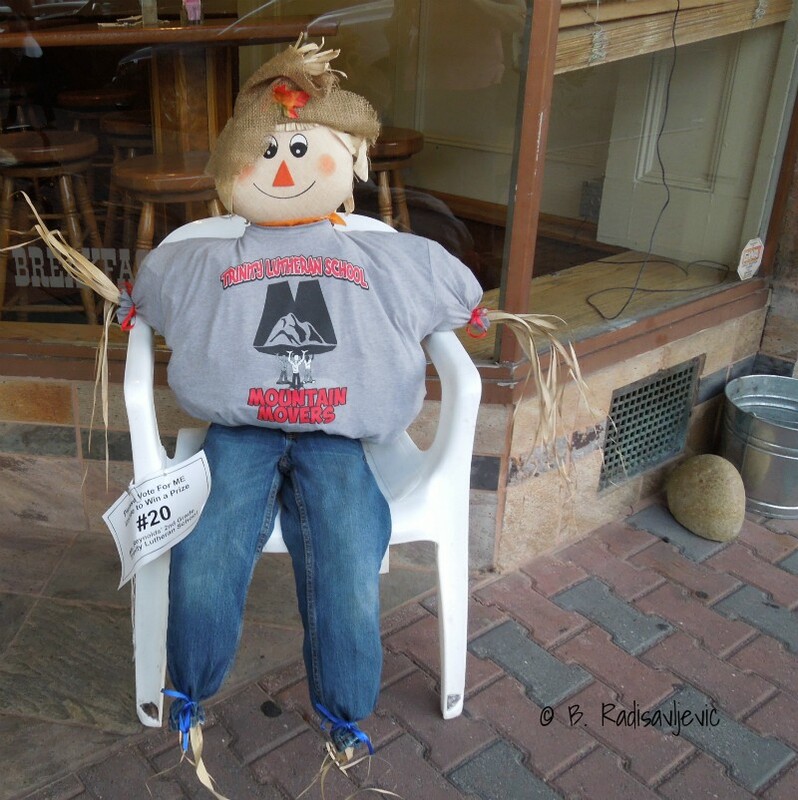 My advice is to go look for scarecrows during late morning or early afternoon. 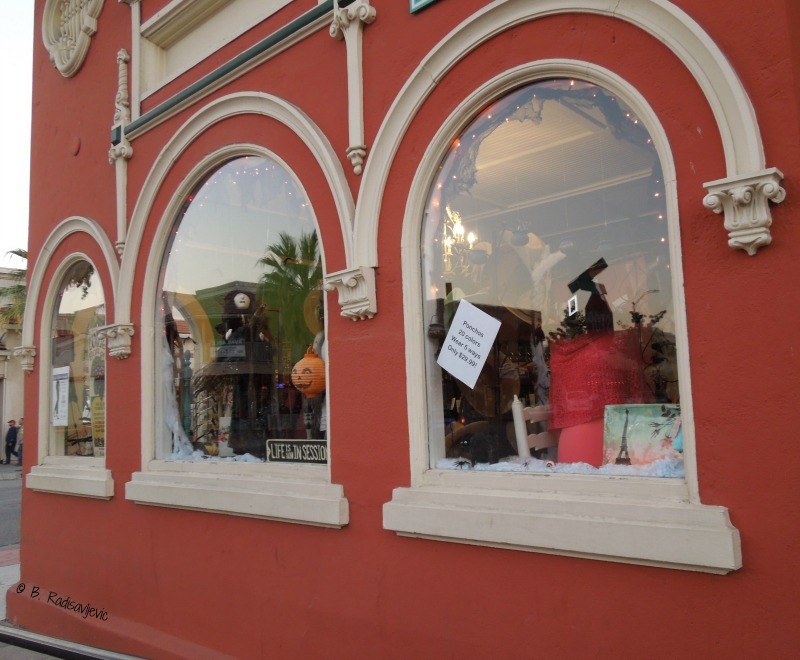 For best results, pick up a guide first at the Paso Robles Main Street Office in the alley between 12th and 13th Streets. Look for the Norma's Way sign. Which of these might you vote for? 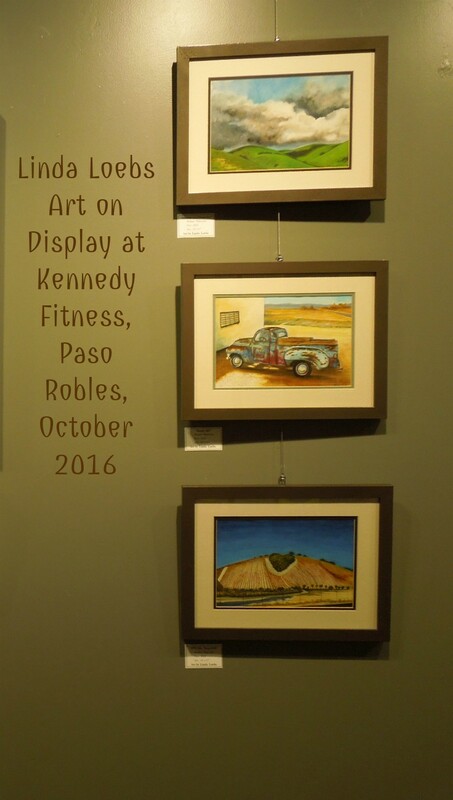 As a fan of local artists, I was delighted the first time I noticed the art wall at the Kennedy Club in Paso Robles. That was last September when Dean Crawford's photography was on display. 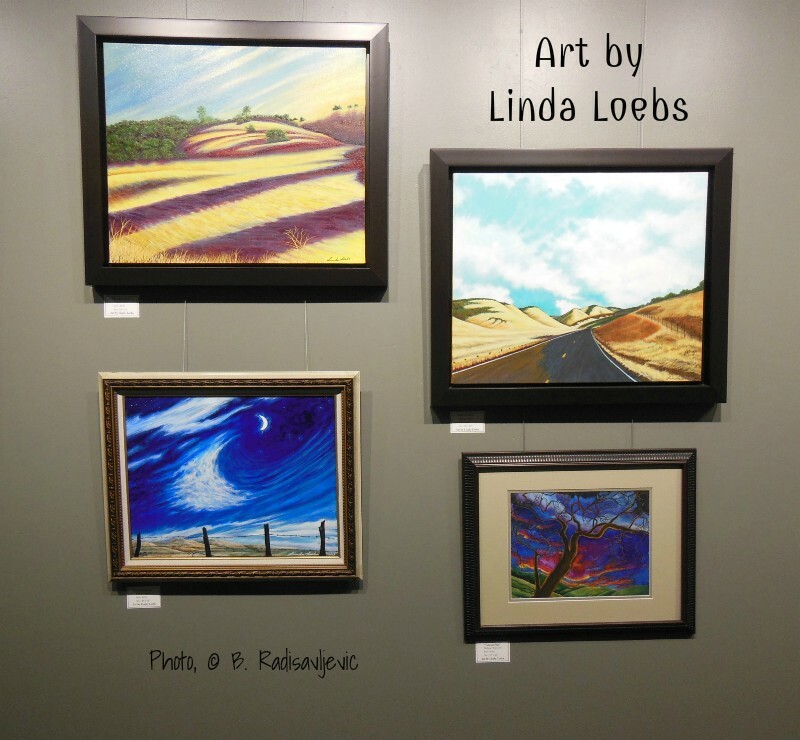 This month we are treated to Linda Loebs' paintings. Here's a sample. 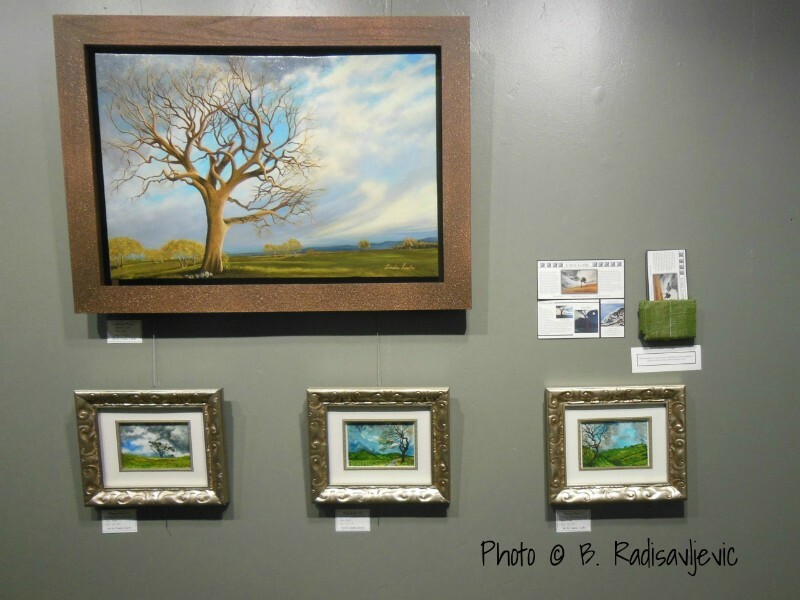 Below you see some of her oak paintings. Here are some brighter colors. 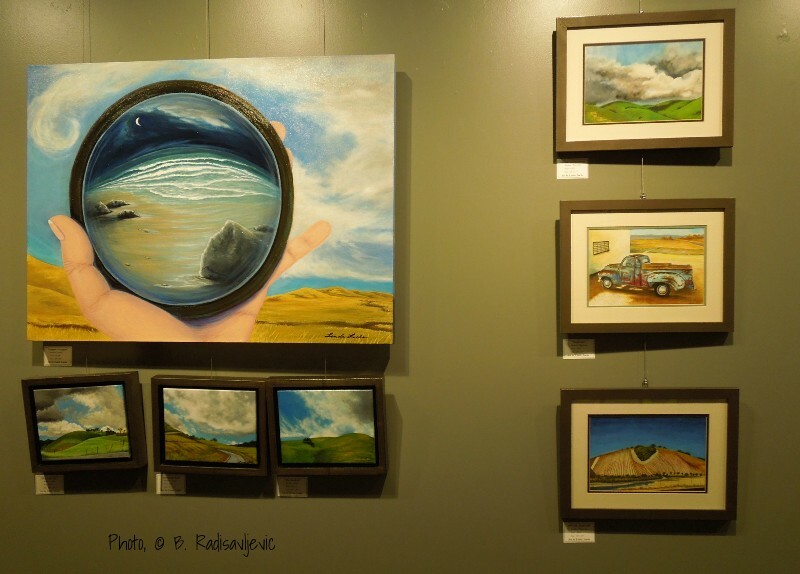 I especially like Linda's painting of Heart Hill you see in the lower right of this grouping. 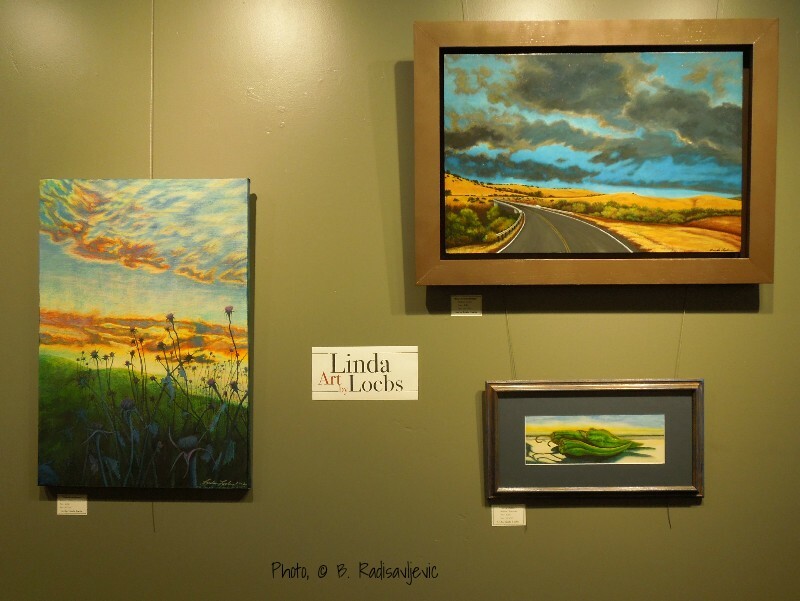 What will you commission Linda to paint for you? 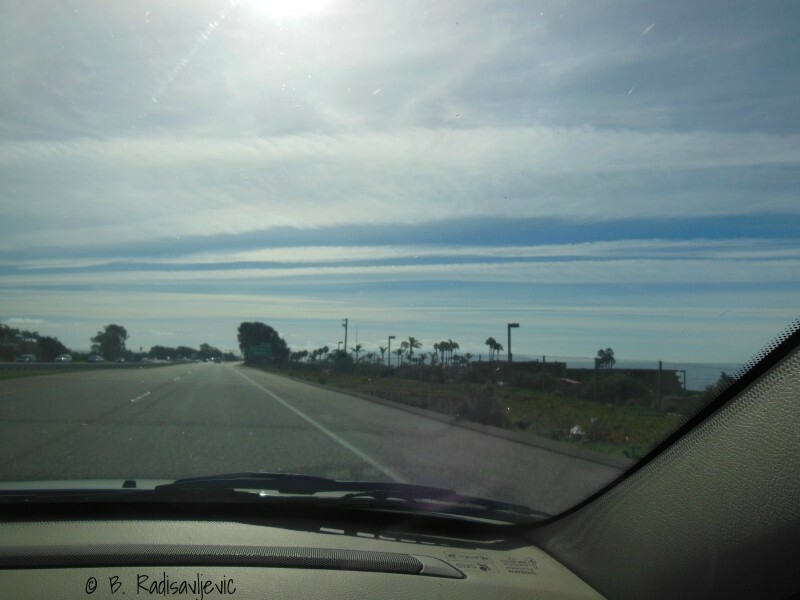 We left on October 15 on a business trip to Newbury Park in Ventura County. 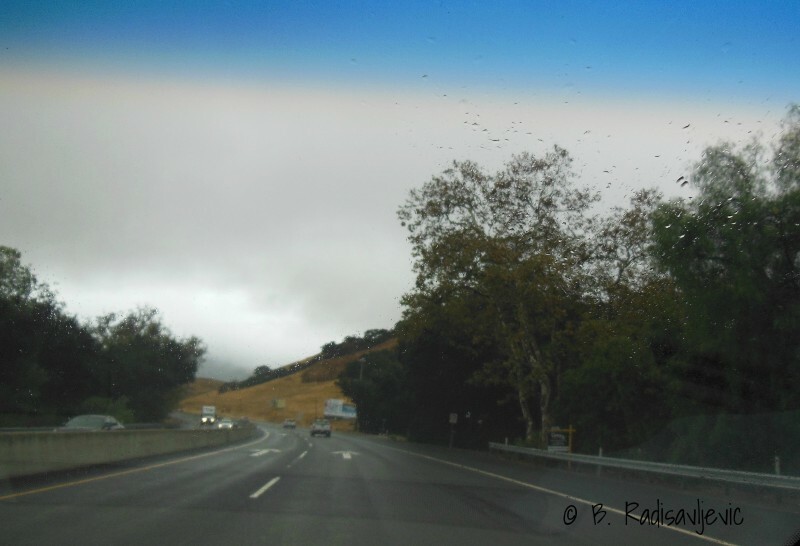 Yahoo told us to expect rain in Paso Robles, but not at our destination in Newbury Park. Sure enough, the rain started to fall about the time we got to Atascadero. 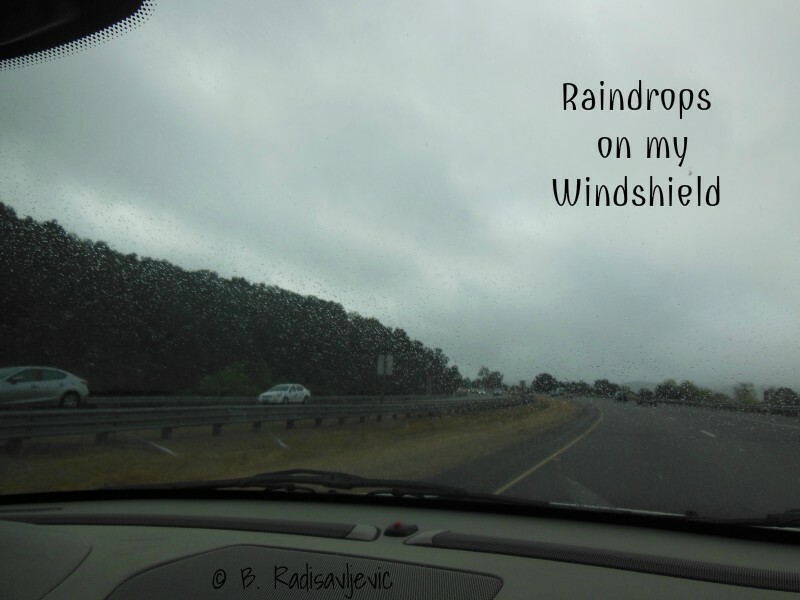 You can see the raindrops on our windshield. We had lovely views of the sky all the way through the county. It rained off and on as we passed under the clouds. Below we are approaching San Luis Obispo. It rained all the way up the grade and through the city. 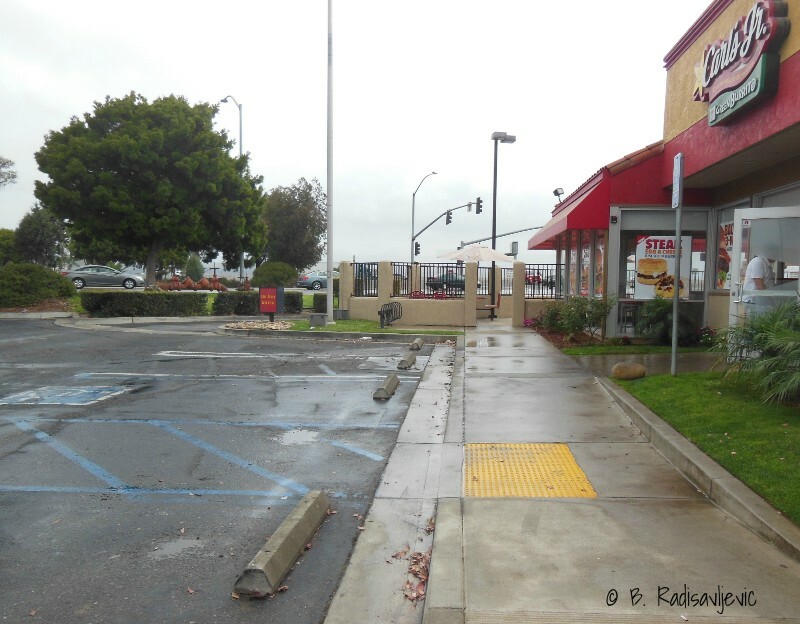 We made a rest stop at Carl's Jr. in Santa Maria, and by then the rain was more a mist, though you could see it had rained harder before we got there. 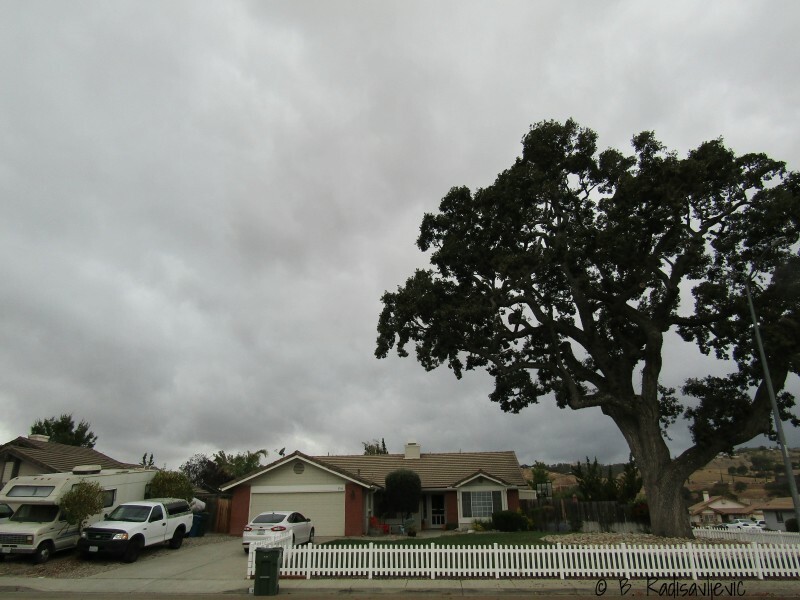 The day after we got home, on October 16, I could see that the predicted rain for Paso Robles would probably come. The clouds had that look, and the wind was giving fair warning. Finally the rain came hard enough so I could hear it. As I write this on Sunday night, it appears the rain is over and we won't see more rain for a while. But at least my unirrigated plants got a drink, and maybe the county's thirst oaks got also got some relief. 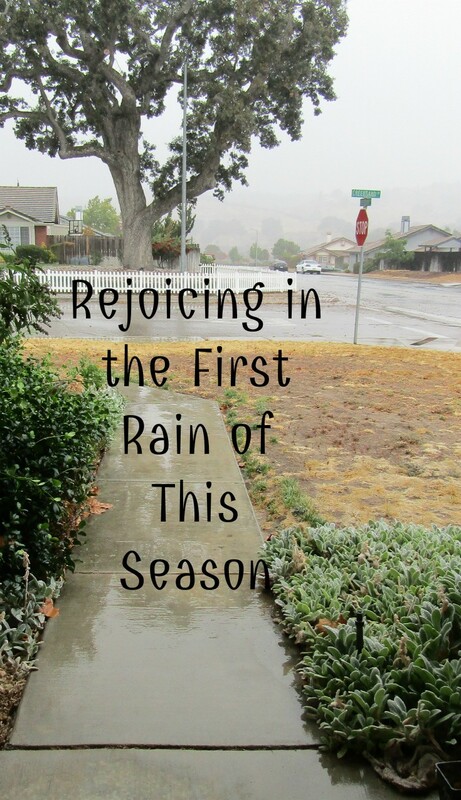 It's a gift of God to everyone in drought-stricken California. Join me in giving thanks for it.